So, in keeping with our habit of starting with the cheapest item(s) first, we'll begin with a discussion of the 60-cent bag's contents. The item on the far left of the above pic should be well known to everyone -- it's the dragon from Dragon Blaster Skeletor! Even though he's free from his evil master, he's still forever anchored to a plate of back armor. Poor dude can't catch a break. While everyone should have been able to name Skeletor's dragon on sight, I'll cut you a little slack if you can't quite place those dinosaurs. But if you can't shake the feeling that you've seen them before, here's a hint: imagine them with blasters and chairs strapped to their hides. Yes -- they're the Ankylosaurus, Styracosaurus, and Deinonychus (Rulon release; apparently the Valorian version has blue stripes) from Tyco's Dino-Riders toyline. Well, I suppose the Ankylosaurus and Deinonychus could be the Smithsonian rereleases, but I'm going to assume that's not the case since the Styracosaurus still has the gun turret notches on its sides. (The Smithsonian versions had the notches filled in -- a fun fact I learned from Dino Riders World. Awesome site; check it out!) Anyway, even though I still have the Dino-Riders dinosaurs from my childhood -- naked; the armor proved to be a whole lot less sturdy than the beasts themselves -- I couldn't pass on these things for 60 cents. They really are fantastic dinosaur toys. You might not recognize this particular figure, but you know who it is: Mr. SMASH himself. 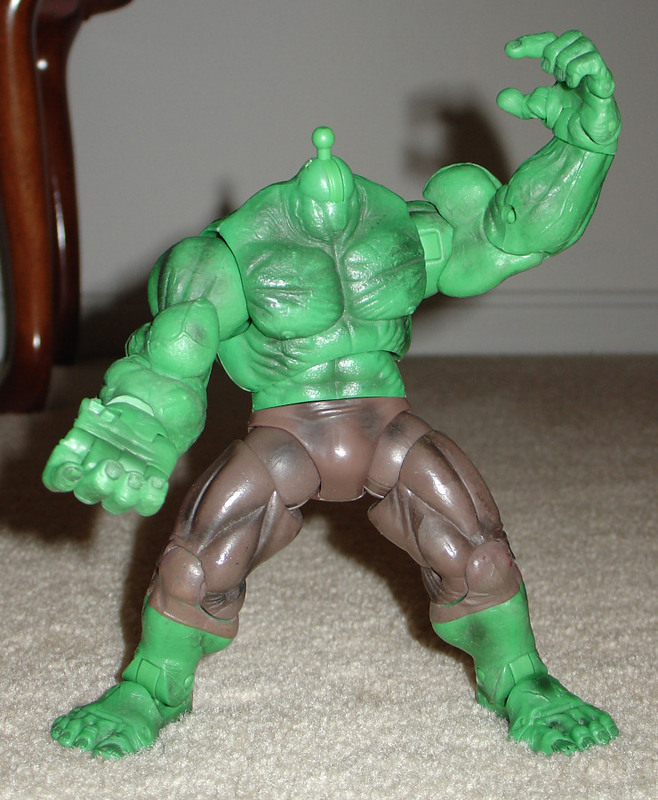 This here's Planet Hulk from the first Marvel Legends wave after Hasbro took over... though it's clearly seen better days, since it's missing its head and right thumb in addition to the armor and shield that it once boasted. Still, it could be useful fodder someday, and 90 cents for a hulking body ain't bad. Finally, KNOW HIS NAME AND FEAR... he. is. Onslaught. I actually don't know all that much about the character -- I'd largely stopped following the X-Men comics when Onslaught was all the rage -- but I remember him well as the final boss of Marvel vs Capcom. 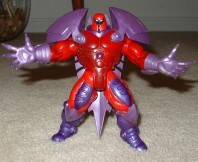 Anyway, this figure is a 1996 ToyBiz release. It looks like it's in fairly decent condition, though it's missing its additional attachments and the calf spike from its left leg. I'd probably never have noticed that if I hadn't turned the figure around -- but I also would have missed out on the "bonus" feature between Onslaught's shoulderblades. I'm sure the villain's true identity (Professor Xavier) wasn't that easy for the characters to discern in the comic books, but it is a fun touch for a toy! 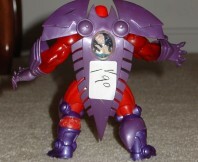 Also, on the back of this particular figure, there's another reveal: the original thrift store asking price. I definitely wouldn't have paid $1.90 for it, and I don't see it being terribly useful for fodder. 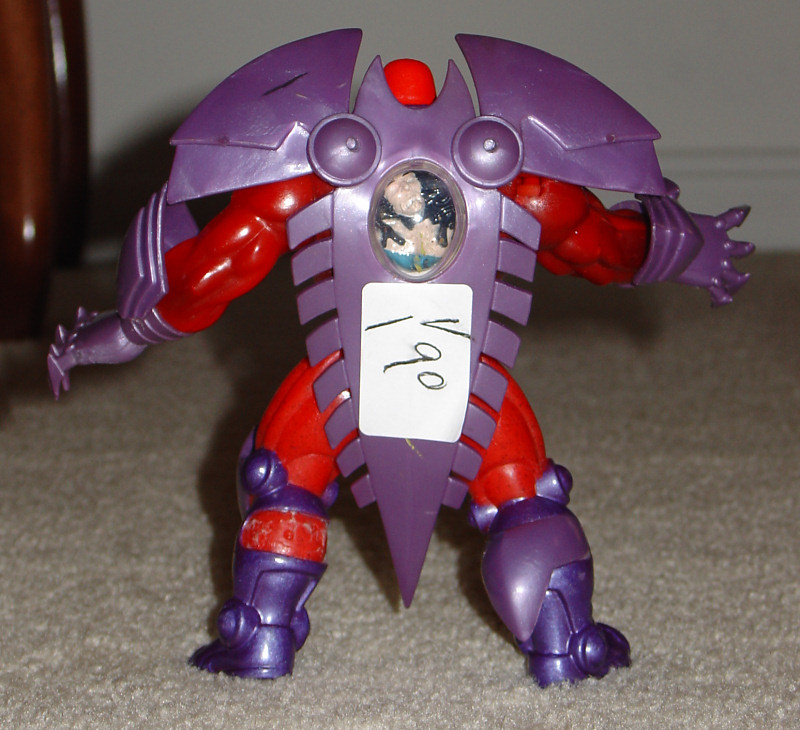 But, for a buck, I figure maybe I can have Onslaught stand around menacing my 3.75" Marvel figures or something. I seem to remember my friend having the bare Dino Rider toys as his dinosaur playthings of choice, and me being covetous of them since mine were a hodgepodge of inferior-quality dinos. It did not sit well with me that he could be having better Jurassic Park playtime than me. Of course, I was covetous in the way little boys are, trying to convince myself that mine were better and that he was a stupid jerk. I'd have bought those toys if I saw them in a second. 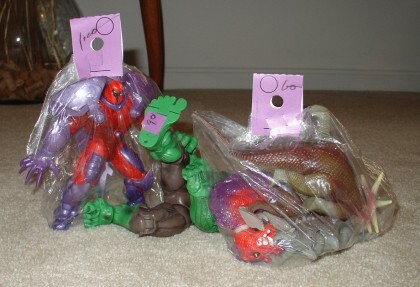 I had some Dino-Riders! Long gone now. I had a nightmare when I was 8 that aliens who looked like the Antmen killed me and my family. Maybe that's when I stopped playing with them.